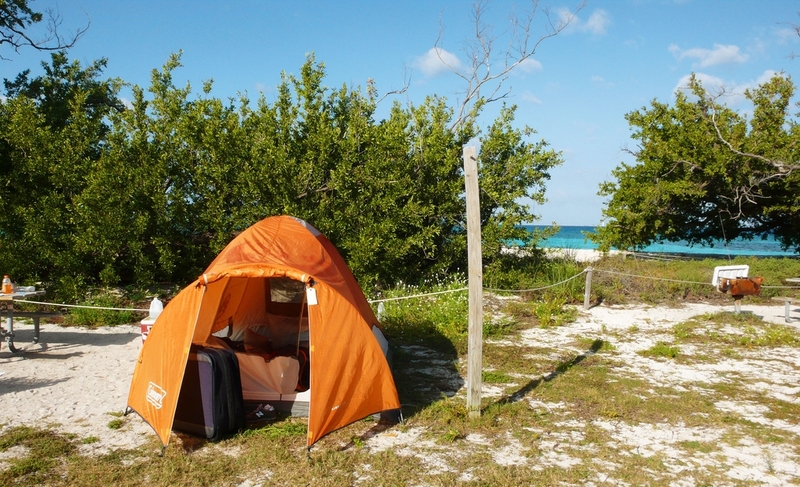 Camping at Garden Key is an incredible experience with amazing star gazing, snorkeling, sunsets, and more. But you must be prepared to camp in this remote location. 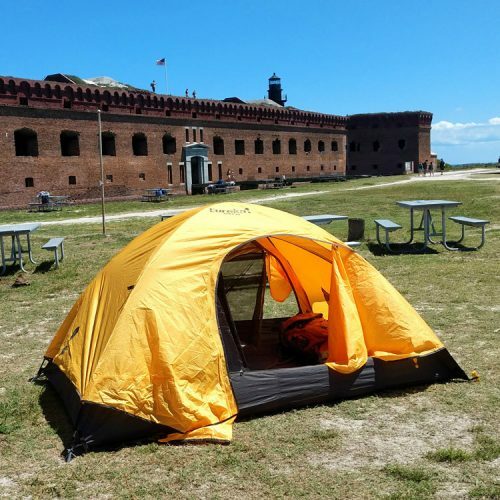 To assist you in your planning, be sure to review the information on this page and follow the link below to learn more about camping at Dry Tortugas National Park. Are you looking for a memorable camping experience? Do you enjoy relaxing sunsets and breathtaking nighttime skies? 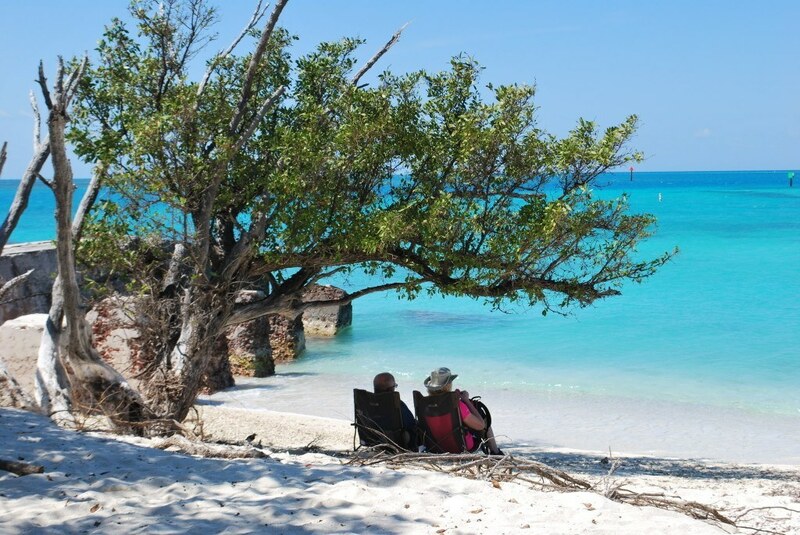 Camping in Dry Tortugas National Park offers that and more. Keep in mind that space and services are limited. 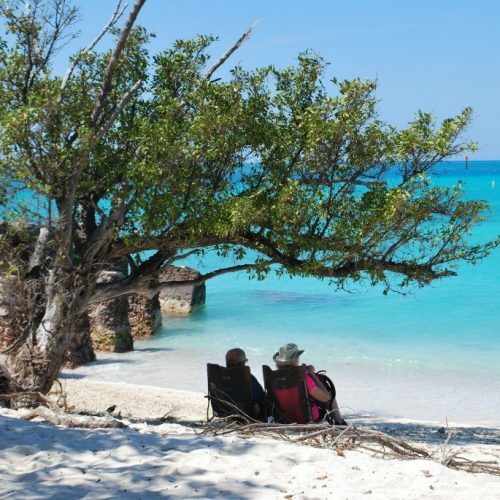 All overnight camping must take place within the Garden Key campground which is located just south of Fort Jefferson. 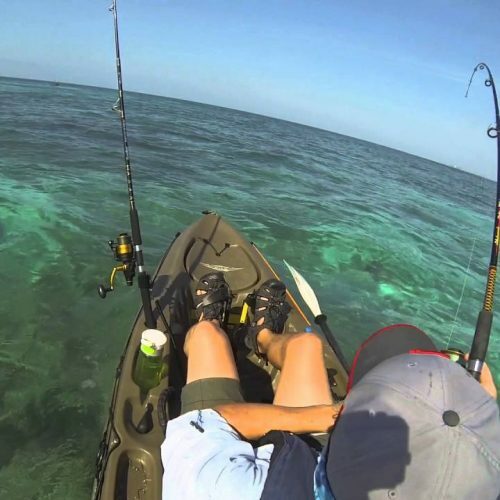 A primitive campground is located on Garden Key and is a short walk from the public dock. The eight individual sites can each accommodate up to 3 2-person tents (total of 6 people), and are available on a first-come, first-served basis. Reservations are not required for the 6-person sites. All campers, once they arrive, will be guaranteed a place to camp. Campsites have picnic tables and grills. Campers must bring all supplies, including a tent, fresh water, fuel, ice, and food. All trash and garbage must be carried out upon departure. Gas camping stoves or charcoal briquettes placed in campsite BBQ units are the only fires allowed.Look for a table with a stenciled number. Only those tables with numbers are assigned to campsites. Should you find all eight regular sites occupied, the overflow area is shared with other campers. Transportation for campers is limited to the Yankee Freedom Ferry and the ferry only takes a maximum of 10 campers per day, each way. Call to make your ferry reservations as early as possible. The sea plane does not offer transport for campers due to the added weight of the gear. This is a primitive camping experience. Campers must provide for all of their basic needs, including food, water, shelter, medication, and other essentials. Composting toilets are available. All trash and garbage must be packed out. There is no store or running water. Food and Water: We recommend two gallons of water per person per day (remember the heat). Bring an extra day’s supply of food and water in case of ferry cancellations. 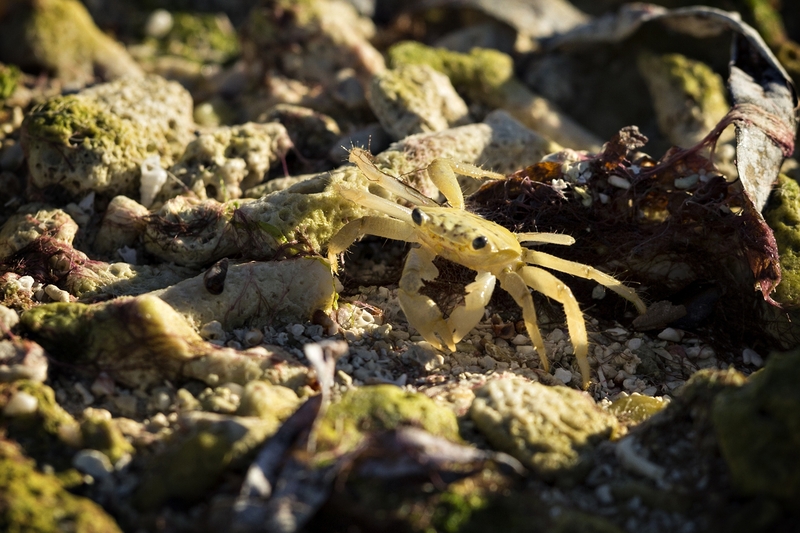 Bring food items in hard-sided containers for protection from rats and crabs. Posts are available to hang food and trash. Shelter: Tent (required), sleeping bag and pad, and strong stakes for the frequent high winds. Cooking: Match-light charcoal for campground grills (fuel is not permitted aboard ferries), waterproof matches and lighter, cooking utensils, biodegradable soap, and trash bags. Clothing: Cold and warm-weather clothing, rain gear, lightweight long-sleeve shirt and pants for sun and bug protection, wide-brimmed hat. Personal Equipment: Medications, first aid kit, knife, flashlight with spare batteries, snorkel gear, binoculars, sunglasses and sunscreen, insect repellent, and personal items. 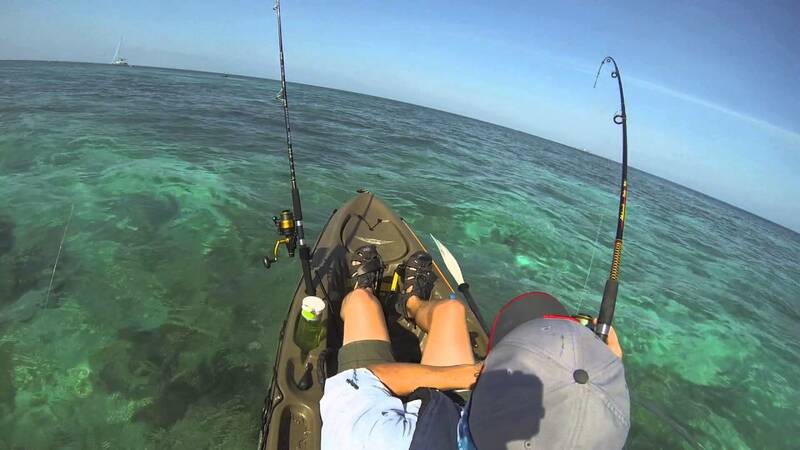 Private boaters and paddlers require additional safety fear. Groups: The group site is normally available for groups of 10-20 campers, and must be reserved in advance. Check with ferries first for additional group size and gear restrictions. Groups of 10 or more campers arriving without a reservation will not receive exclusive use of the group site. Transportation for campers is limited to private vessels and the daily commercial ferry that takes a maximum of 10 campers per day each way. Private vessels should check in with a ranger upon arrival at Garden Key for camping information and vessel anchoring areas. The seaplane does not offer transport for campers. 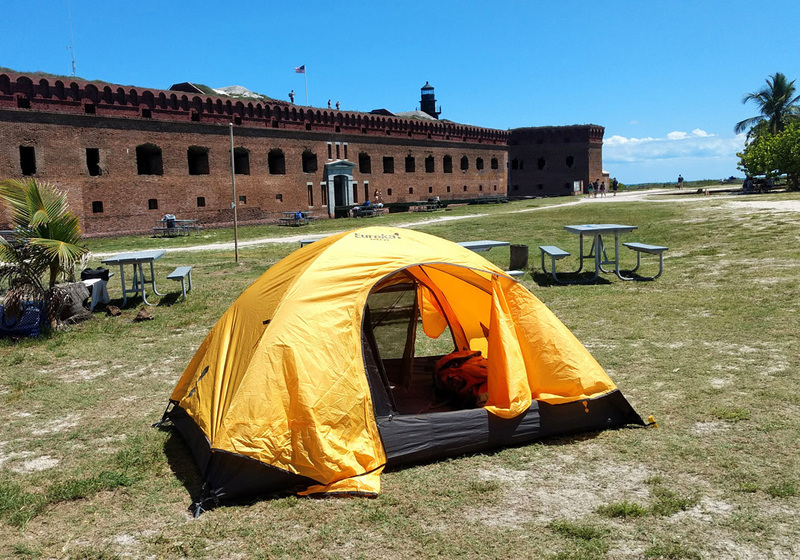 The ferry can bring campers and their gear to the Dry Tortugas. You should check with the ferry operator for details on what they will transport by calling them at 1-800-634-0939. Once you arrive, there are wheeled carts at the dock to assist in moving your camping gear to the campground. Due to the limited number of spots on the ferry, we recommend booking your trip months in advance, especially during the winter holidays and winter season that tends to be busier, as visitors from northern chilly climates head to south Florida sunshine. If you arrive at the park with the daily commercial ferry, you will have a spot to camp. Garden Key is a small island, but we’ll work at finding a place for you to pitch your tent – and you must have a tent to camp. 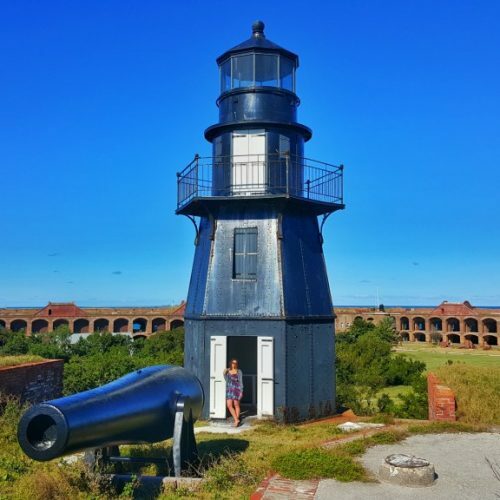 Overnight anchoring is allowed in the area of sand and rubble bottom within 1 nautical mile of the Fort Jefferson harbor light and must not block any designated channel. 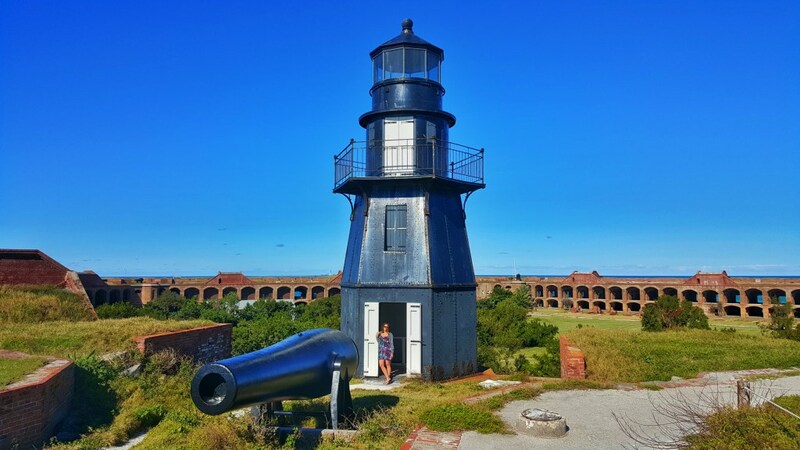 Overnight anchoring is not permitted at any other location in Dry Tortugas National Park. Upon arrival, the wheeled carts on the dock can be used to assist in moving your camping gear from your vessel to the campground. 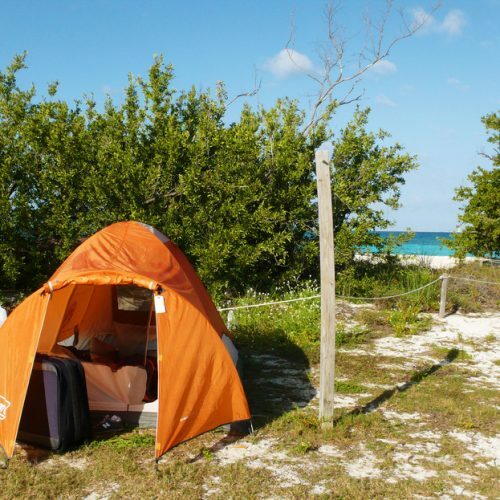 The Garden Key campground is a self-service fee area with a nightly fee of $15 per campsite. A 50% discount applies to holders of the Interagency Senior or Access Passes. No other discounts apply. Please bring the correct amount in cash. On the day of arrival, campers must obtain a payment envelope at the self-service fee station. Fill out the envelope, deposit it in the slot in the iron post, and keep the stub at your campsite for ranger inspection. Note that fees paid for transportation (commercial ferry or seaplane) include the park entry fee but do not include camping fees. A group site is available for 10-20 people and must be reserved in advance. 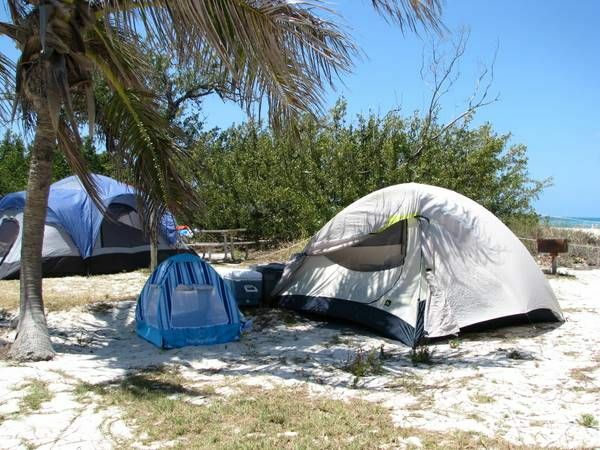 Call (305) 242-7700 to obtain a Group Campsite Reservation Application. Groups of 10 or more arriving without a reservation will not receive exclusive use of the group site. Each of the regular campsites contains a table, post for hanging food, and a BBQ grill. 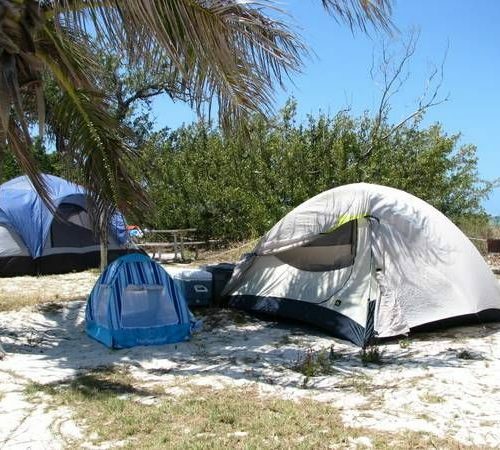 Three tents and six campers are the maximum allowed per campsite. All equipment must remain within ten feet of your table. Trees and shrubs are crucial to provide some shade and wind break. 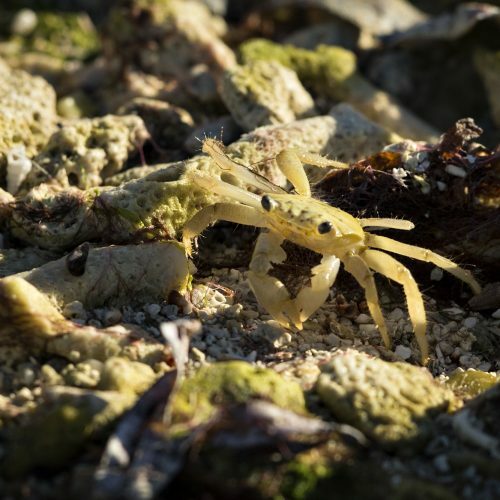 Help protect this valuable vegetation. Do not attach anything to campground trees (but clothes line may be strong between posts). All camping gear must be free standing. Respect closed areas of the park. Charcoal briquettes placed in campsite BBQ grills are only fires allowed. Gas camping stoves are permitted by the park, but commercial ferries do not permit them on board. Composting toilets are located in the campground. Waste is composted in the equipment below the units. These systems are very fragile and are designed only for the disposal of human waste and toilet paper. Please do no put trash, food scraps, or other items in these toilets. Please lower toilet lids when not use in use reduce odor and aid in the composting process. The composting toilets are closed from approximately 10 a.m. to 3 p.m. During these hours, please use the facilities aboard the commercial ferry boats at the dock. Grey water from dishwashing, etc. should go below the high tide line at the dinghy beach. Rats have inhabited the Tortugas probably since the arrival humans. Though the size of the rat population is controlled, rats may be encountered as they forage through campsites looking for food. The only reliable way to protect your food and prevent damage to your gear is to store your food and food trash in hard-sided containers. Rats will chew through tents or backpacks if they smell food, and can also climb the provided handing posts. You may keep boats in your site or on the shore near the designated dinghy beach. Boats of all kinds are prohibited in the swim area. Boats may only be launched from and landed on the designated dinghy beach, which is located near the government docks. Remember to wear a life jacket at all times while boating. Please be considerate of other and observe quiet hours from 10 p.m. to 6 a.m. The use of bright lanterns is also discourage during these hours. 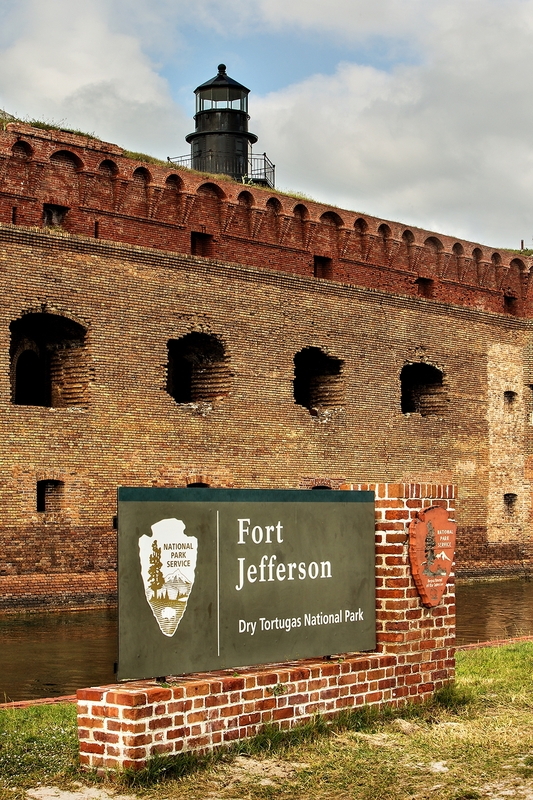 One of the great pleasures of any visit to the park is the opportunity to explore Fort Jefferson. Be careful inside the fort. Many areas have uneven walking surfaces. 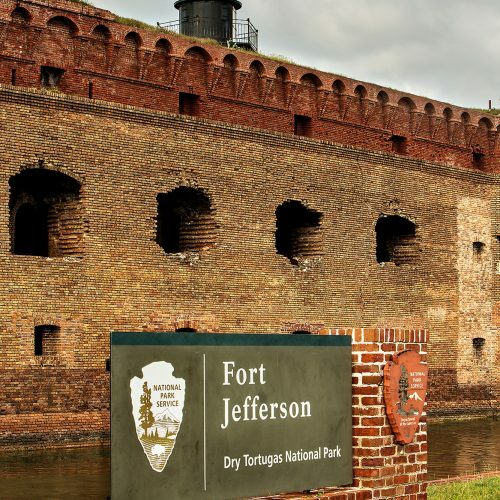 The fort is open sunrise to sunset, or to contact a ranger in an after-hours emergency. The moat wall, beaches, and other exterior public area remain open after dark. On the day of departure, completely clear your campsite, place all camping gear on the main dock, and return all hand carts to the dock by 10 a.m. Once the ferry boats offload arriving passengers and equipment, see the captain for instructions on loading your gear. You may keep any items you need for the day in the day use area.